For decades, those three words triggered fever dreams of speed, style, and, with a wink, an extra sprinkle of sexiness. In 1965, they helped talk 1 million Americans into the Chevrolet Impala, which remains the single biggest-selling passenger car this country has ever known. But walk into a Ford showroom next year, and you might have trouble spotting its last remaining “car”—the iconic Mustang—amid a Stonehenge of towering crossovers, SUVs, and trucks. There will be no sedans at all down the street at the Chrysler showroom, and by late next year, the history book will also snap shut on that onetime king of American sedans—the iconic Impala. What the heck has happened? Everybody who was blindsided by this apparent rogue wave of change now seems to be an expert on what caused it. Here on our little island of car-testing expertise we happen to pride ourselves on measuring performance, and as I commute every day on L.A.’s infamous 405, I’m often surrounded by newbie crossover drivers weaving through lanes (sometimes past me). 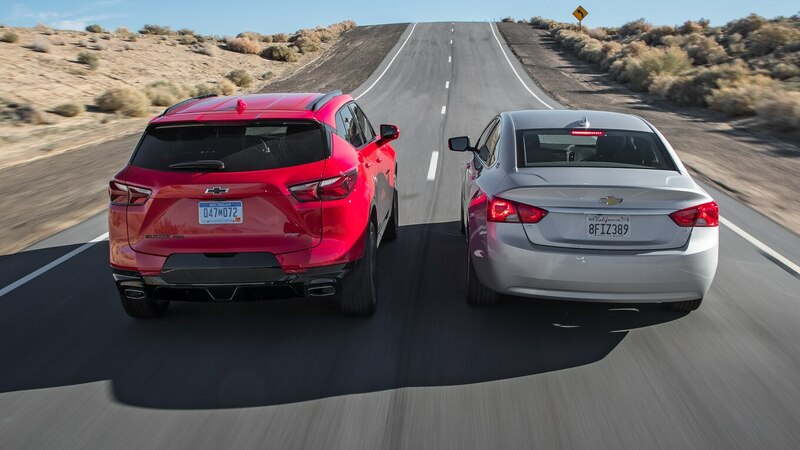 Do they really understand how their SUVs’ dynamics differ from those of the sedans they traded in? Judging by how closely they tailgate at 80 mph, I wonder. And I’m guessing plenty of workers at GM’s Hamtramck assembly line are wondering what’s next for them when Impala production ceases next year. That car’s demise deserves a moment of reflection and postmortem perspective. For me, it means it’s time to snap on the latex gloves for an automotive autopsy to better understand how we got here. Was it a justifiable homicide? Or an irrational casualty of the notorious whims of automotive fashion? The following is a three-view look at this. Tom Vanderbilt, author of Traffic: Why We Drive the Way We Do (and What It Says About Us), will give us his perspective driving a crossover (in Brooklyn, no less). Executive editor Mark Rechtin has assembled a big-data look at the trends of the phenomenon and what the future could hold for our generation of elephantine transport. I’ve gone micro, zooming in on some measurable trade-offs between two representative examples of vehicle configuration. It seems only fitting that the sedan corpse we’ve laid out on the dissection table is the final iteration of the once-iconic Impala. The crossover we have under arrest for its murder is the new, high-interest Blazer. 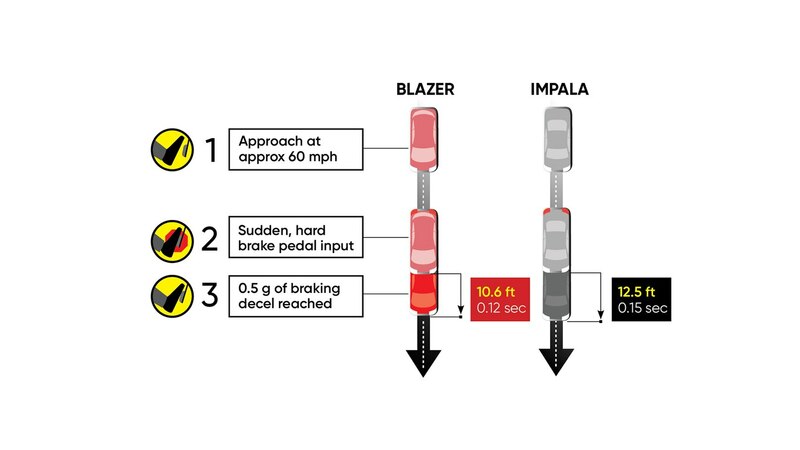 In fact, it could be the very crossover that many Impala drivers will switch to. Both vehicles have V-6 engines of nominally 3.6 liters, which differ by an unnoticeable 3 hp and 6 lb-ft. Their wheelbases are off by an inch, and they have about the same front headroom. You can barely slip a piece of paper between their basic test track results. 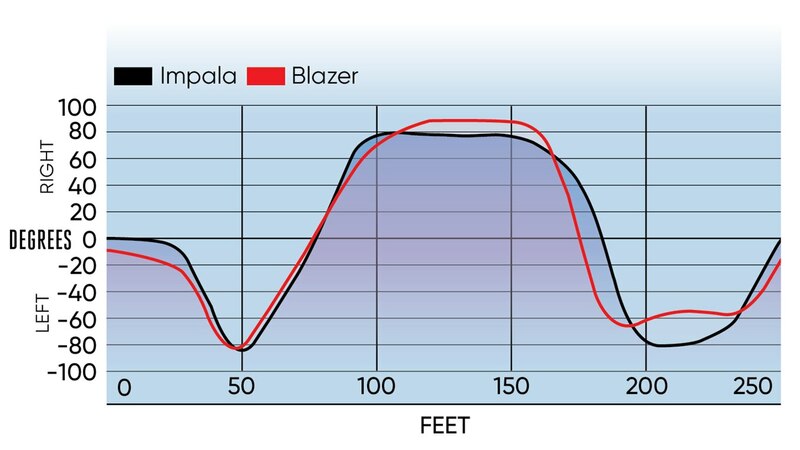 Blazer: 0–60 in 6.1 seconds, 60–0 stopping in 126 feet, maximum lateral grip of 0.83 g. The Impala does the deeds in 6.2 seconds, 124 feet, and 0.84 g. Their combined-cycle fuel economies are 1 mpg (235.2 L/100 km) apart. So why is one a dead sedan rolling while the other keeps catching the eyes of strangers, who approach me to ask if this really is the new Blazer and would I mind if they checked it out? 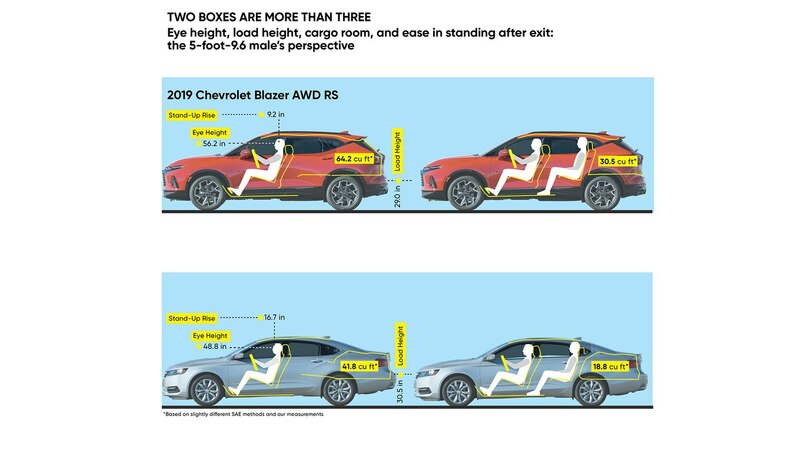 Other numbers in these vehicles’ basic specs are obvious clues: Our test sample of the Blazer has all-wheel drive, it’s 8.1 inches taller, and its rear cargo capacity of 30.5 cubic feet (expandable to 64.2) overwhelms the Impala’s 18.8 cubic feet of trunk space. Yet, as comparably equipped as possible, the Blazer would be about $8,500 USD dearer. 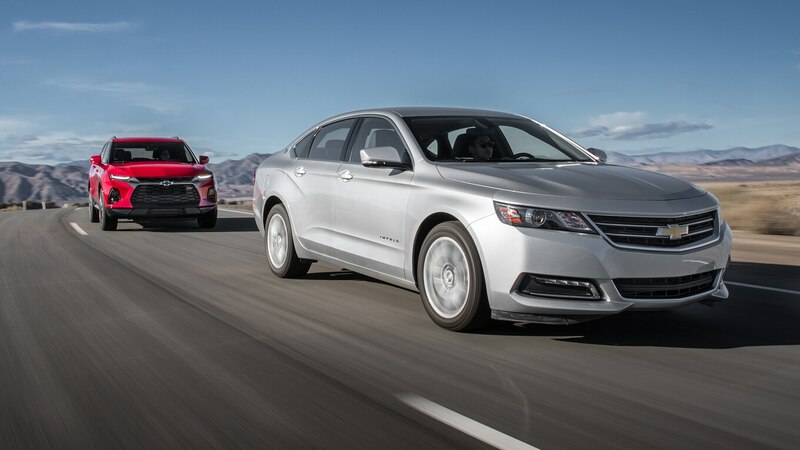 In our test, the gap widens to $14,040 USD between our Impala LT and the sporty Blazer RS. Why the bare-bones LT Impala? Chevrolet’s cupboard was bare of press-fleet Impalas (seems they’ve mentally moved on, as well), so this one is a rental. Maybe you’ve even driven it. In comparison, the Blazer’s RS trim appears to be a mismatch—except it isn’t. As we’ll see. But these basic specs are just an initial incision into the corpse. It’s time to grab a bone saw, open it up, and look inside. 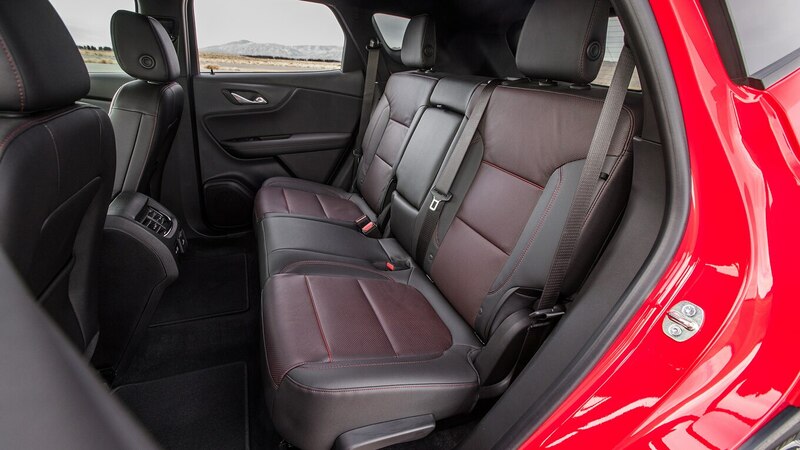 Preconception: SUVs have more room, more versatility, and a more commanding view. For comparison, we’ve seated a typically proportioned, average-height (5-foot-9.6) American male in both vehicles’ front and rear rows. Although driving position is a matter of taste, we set the seat back rake at 25 degrees, the driver’s ankle at the same angle (slightly under 90 degrees), and placed eye level at mid-windshield height. In this position, both drivers have similar headroom. 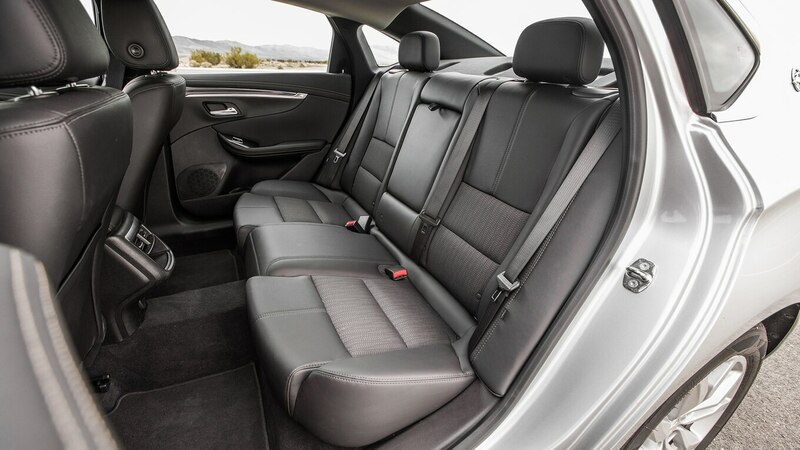 However, the Impala’s rear headroom is tight; on the flip side, its second-row kneeroom is bizarrely generous. (The Blazer’s rear head- and kneeroom are considerably better distributed between the two.) The Blazer’s 56.2-inch eye level is 7.4 inches higher, while our 5-foot-9.6 guy’s stand-up rise (after stepping out) is 45 percent less—it’s certainly racking up some ergonomic merit points. Cargo? Besides their obvious differences in volume, there are nuanced details. As you fold the Blazer’s rear seat, the bottom cushion’s more complicated hinge translates it lower and forward, providing space for the seat back to flatten level with the cargo floor. The Impala’s 1.5-inch-taller cargo lift height is followed by a 7.0-inch drop to a lower trunk floor. That’s annoying if you want to slide a big object in or out, but then again, if stuff shifts around in transit, at least it won’t fall out at your destination. Lastly, check out their differences in overall length. 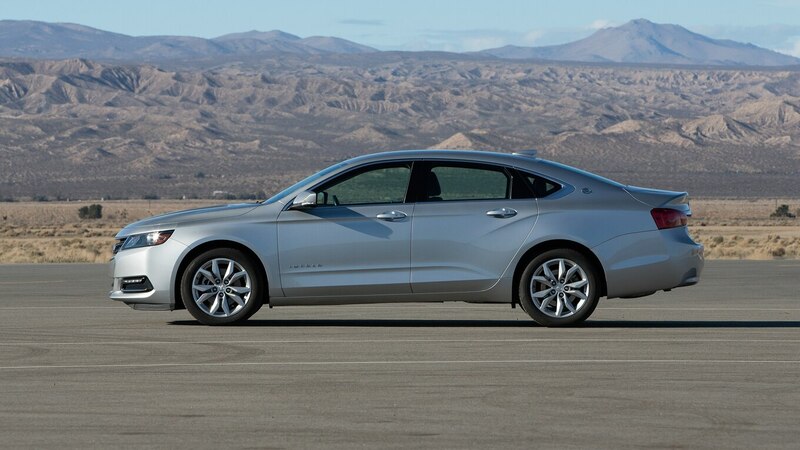 The Impala’s extra 9.9 inches of stretch bestows it with a slipperier shape and its aperture (revealed by folding the rear seats) provides extra length for longer, slender objects. Like a 7-foot surfboard. The Blazer can only cart around a puny 6-footer. I know, this is a California problem. Preconception: A crossover can’t handle like a sedan. Reality: Well … it can come shockingly close with a properly sport-tuned suspension. In addition to our standard track tests, we selected a few challenges to further press the Blazer’s athleticism. 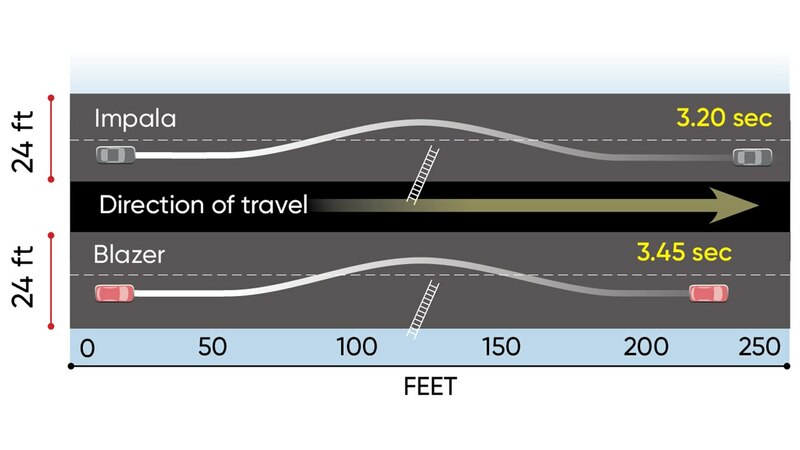 The Double Lane Change we’ve concocted is a series of 50-foot segments—entry shoot, transition to the next lane, another 50-foot transit back to the original lane, and then exit, at the fastest speed as the test can be safely completed. 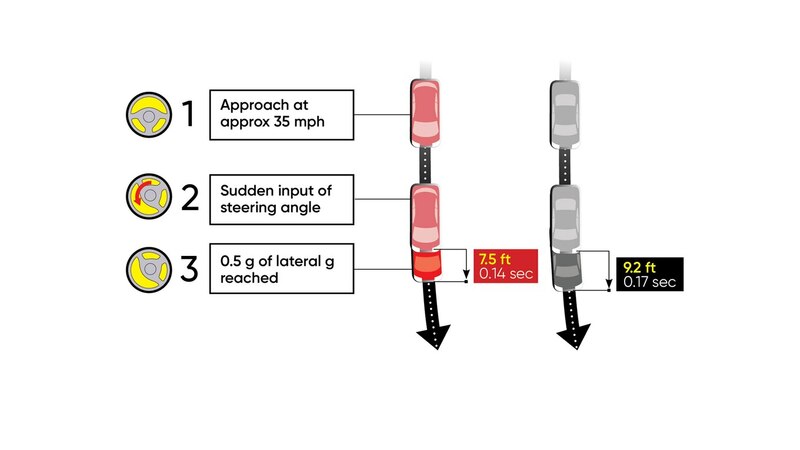 In the accompanying graphic, I’ve placed a ladder in the road; we’ve all seen the real thing at the last second and had to swerve mightily, just like this. Preconception: You pay a price for that treasured eye height. Reality: Don’t be so sure. For comfy ride quality and quiet interior noise, everything about the crossover is wrong, right? A tall, blunt shape with a high center of gravity, it should stir up more wind noise. Its bulkier rolling stock drums in extra tire hiss and structural boom (emphasized in the second row due to the absence of a trunk bulkhead to blunt the rear suspension’s noise). Meanwhile, ride quality gets hammered from the greater unsprung weight and higher, pitchier occupant position. 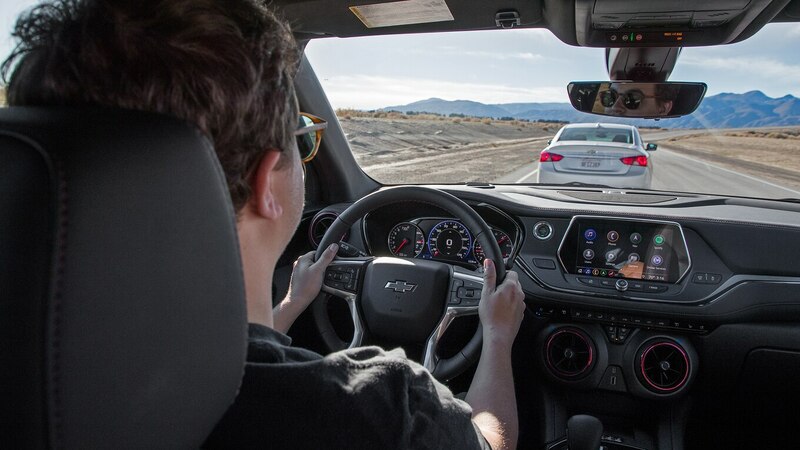 To test this presumption we recorded the accompanying evidence at 70 mph (113 km/h) around the low-banked 7.5-mile (12-km) oval at Honda’s Proving Center in the Mojave Desert. The oval includes a 2-mile (3.2-km) reproduction of L.A.’s choppy Interstate 110. And yes, we drove 70 miles (113 km) to test there even though the real thing is 5.5 miles (8.8 km) away from our office. The attraction? No traffic. This makes it perfect for testing ride quality (using a vertical accelerometer on the seat) and head toss (via a trio of accelerometers on my head—please don’t picture it). Simultaneously, we interpreted the vehicles’ interior noise in both dBA and sones (a unit far truer to the experience of loudness) and estimated how powerfully their frequency ingredients mask our comprehension of conversation (their Sound Interference Levels). 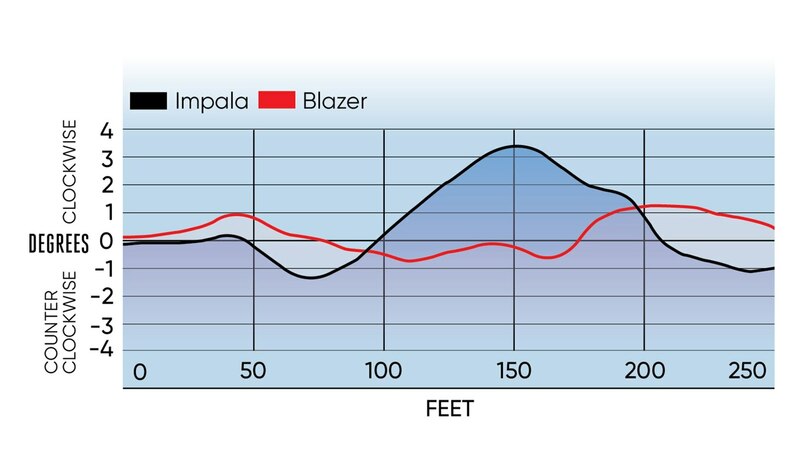 As expected, ride quality is usually worse in the second row, and the Impala betters the Blazer in every ride situation except the front-seat shaking on the faux 110. For interior noise, the Blazer is surprisingly pianissimo on the coarse 110 (despite its 7-pound-heavier (3-kg) wheels and tires); the Impala is more muted on the smooth surface. But noticeably, in every circumstance, speech communication is easier in the Blazer. Clearly, GM put a lot of work into tuning for that outcome. Several currents have been slowly converging on this moment. One is Americans’ changing taste in ride quality. Not many people today remember the soupy “boulevard ride” we once adored, even worshipped. (I remember my dad fawning over the floatiness of our suicide-door Lincoln when I was a kid.) Beginning in the 1980s, taut German sedans replaced the American luxury float with winch-down body control—at the price of sharper, quicker-frequency ride impacts. Little did the BMW 2002 know it was paving the path to the modern crossover. 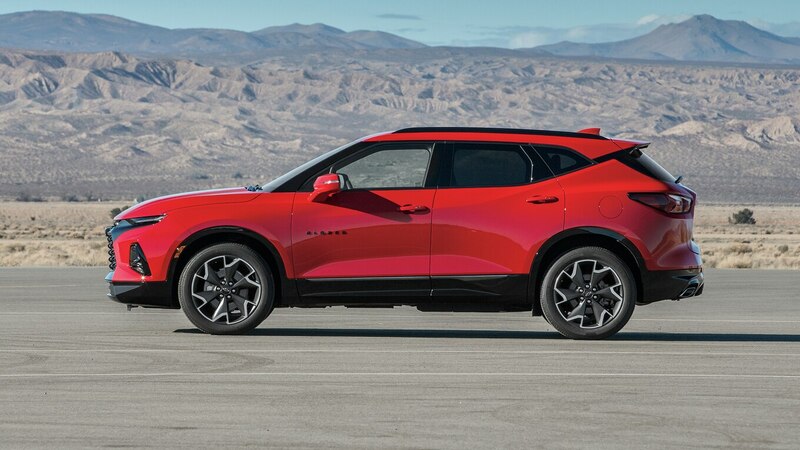 Without this transformation, a modern crossover with its raised center of gravity would be a four-wheeled bouncy house. 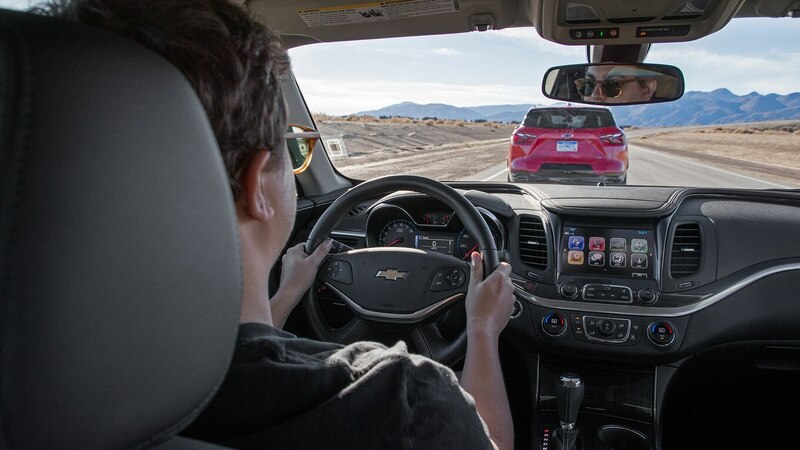 But the continual refinement of stability and ride control systems—made possible by reduced costs for sensors and electronics—now allows crossovers to ride and handle almost as well as sedans. 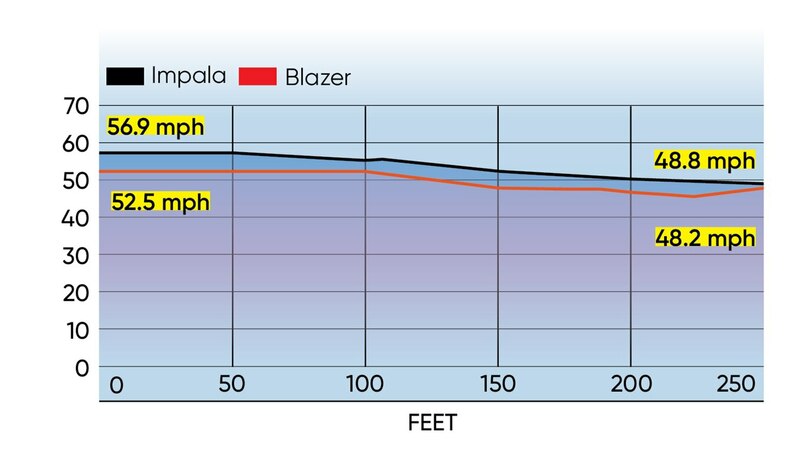 In our lane change test, the Blazer seemed to defy the law of (and its center of) gravity and nip at the Impala’s heels through the cones. Without that stability control, such maneuvers wouldn’t be possible. 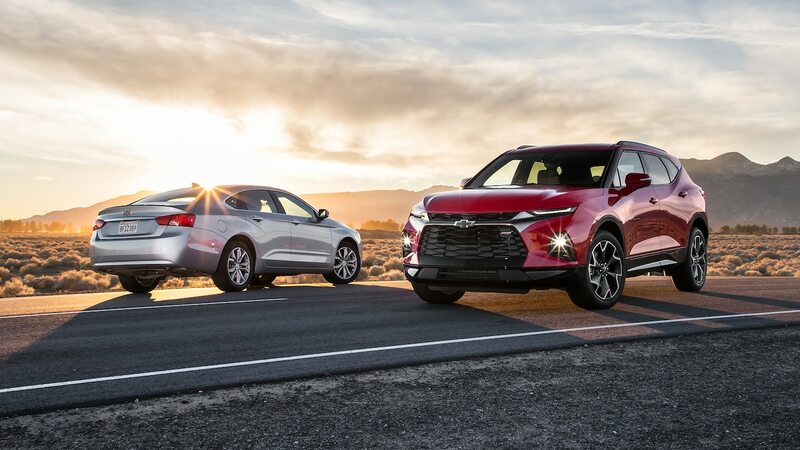 Credit electronics, too, for enough fuel efficiency (and emissions) improvements to virtually pardon the crossover’s penalty of added weight (541 pounds (245 kg) here), coarse-treaded all-season tires, and draggier aerodynamics. Then there are bigger-picture trends: Older Americans are eager to ease the process of getting into and out of their vehicles, young families are prioritizing kids’ activities and room for cargo and car seats, and our growing densification into urban centers means a periscope perspective on traffic is a big competitive advantage. If a high eye height translates into less speed stress, that’s cool, too. All these currents are now colliding and mixing into this segment shift few saw coming. It isn’t just a stylistic detour or a mindless herd mentality by car buyers that will inevitably bend back toward the good old familiar sedan. Just the opposite. When, 123 years ago, the first customers for an American production car climbed into their Duryea (look it up), they sat at a familiar height to the horse-drawn buggy in their barn, and its giant wheels let it go anywhere. Engines that stand much shorter than a horse gradually collapsed the sedan’s height into the decades-long standard of longer, lower, and wider. This ended with the sedan—indeed, this Impala—finally lowering itself into its own grave. Although the reasons for it have changed since 1896, the height of the American automobile is, nevertheless, back where it started.